Webstagram Hiring: UI/UX Designer Content-Aware Fill Snea.. This looks pretty nice, I’m using it right now. I like Google reader too. 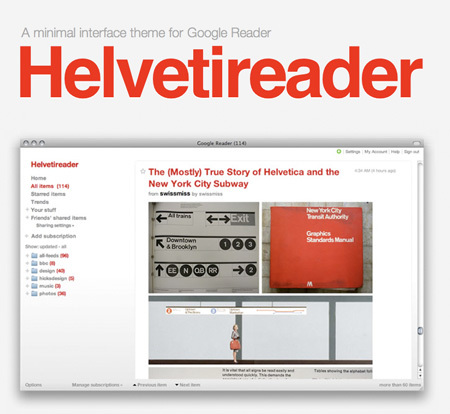 Eventually Google is going to bring the themes from Gmail into Google reader, but Helvetireader is much nicer. looks pretty clean indeed, I’m using bloglines witch works okay, but it has allot of options i don’t ever use + it is not as fast as i hoped it would be. I was wondering if it was possible to export all my feeds into another reader? Very nice. Does anyone know how to get this working in Fluid? that’s the official screen-cap from the helvetireader site… I am no font expert, but I’ll take a wild guess and say that they probably used helvetica for that screen cap. Ive been using it for a few weeks now and love it so much more then the standard google reader. Now I need to start organizing all my subscriptions….How many do you currently have? Favorites? here is my current list. there are a lot of unread posts in there, mainly because I’ve been somewhat addicted to Digg lately. shouldn’t be too hard with chrome, google makes both! Looks nice, and feels a little faster too. I changed the css a little bit though, because Helvetica doesn’t look very nice for web text in Windows. I chose Trebuchet instead. Does anyone know how to make Helvetica look nice in small sizes in Windows? I’ve been using this for a few weeks as well, about the same time as I pared down my subscriptions. Coincidence? Sorry, I just assumed it was your screencap. I’m no font expert either, and after further review I was bass ackwards on fonts. It is Helvetica. I was looking at the “r” and thought I remember that arial “r’s” ended at 90 degrees instead of at an angle. But it is the other way around. This skin is changed my life. My eyes will thank for it.